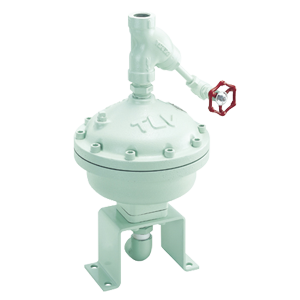 Discharge condensate mixed with high-viscosity fluids such as oil from compressed air distribution piping using TLV's TATSU2 air trap for high viscosity fluids. Hydraulic oil can get mixed in with condensate during transport through compressed air piping. This often clogs air traps, impeding discharge. The Tatsu2 was purpose-built with a large 16 mm (5/8") diameter valve orifice and a special self-cleaning function to automatically discharge condensate and oil. This unique design helps prevent damage to the equipment and the products being manufactured. 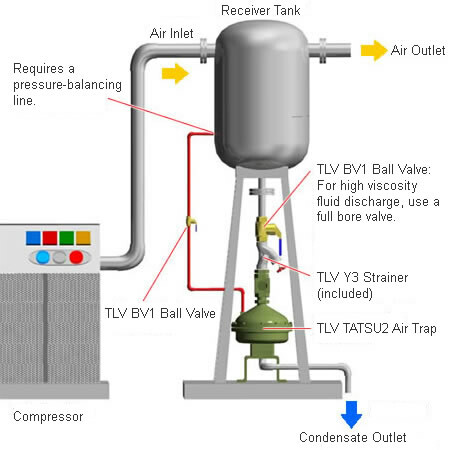 Air-using receiver tanks or other equipment with higher viscosity condensate. Without a pressure-balancing line connected between the trap cover and a dry portion of the piping/receiver tanks, air binding may occur. Condensate and oil flow into the trap and accumulate. When the condensate level in the trap body rises to a point where the floats lift the float holder, the pilot valve opens with the help of the coil spring. When the pilot valve opens, secondary pressure air enters the pressure chamber lowering the piston and opening the main valve to discharge condensate. While the condensate inside the float cover discharges, the floats fall and cause the pilot valve to close. The pressure in the pressure chamber is released to the outlet and the piston rises to close the main valve after a slight delay to allow the main valve to self-clean during discharge. When enough condensate has accumulated, the cycle begins once again.